Welcome to the Close-Combat Forum. 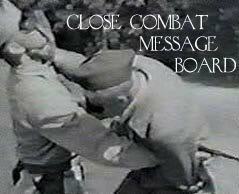 This is a Close-Combat board, devoted to discussion on WWII-Combatives Close-Quarters Battlecraft, Reality Based Self-Defense, Edged-Weapons, Knife-Fighting, Impact-Weapons and the Tactics, Strategies and Concepts used in the REAL WORLD! Check it out: Battlefield forum aka Close-Combat forum. Loads of knowledgeable members, including Combatives luminaries such as Clint Sporman, Ralph Grasso, V42", "stickfighter", and more. Various sub-forums including a special section archiving Carl Cestari, Clint Sporman and also Ralph Grasso posts. Great subsection with Techniques with pictures. Veritable goldmine of combatives/self-defense info!